Today, March 12th, 2014 is the day Farouk Lawan and his Vice Chairman Boniface Emenalo appear at the Court of Appeal, Abuja on a seven-count charge of obtaining N625,000 (N94 million) bribe from Femi Otedola, the Chairman of Zenon Petroleum and Gas Ltd.
We anticipated the case November 27th, last year but the case was adjourned to today because the presiding judge, Mr. Mudashiru Oniyangi found it convenient to “represent another judge” at the graduation party of the Nigeria Law School, Bwari. That was an unfortunate shame. We shall not wait any longer. We are tired of being a nation of thieves. If our leadership has dedicated itself to robbery and decided to protect and honour thieves, we the people reject this abomination and refuse to continue carrying the curse this leadership plants upon the nation that is leading to unexplainable deaths and terror of our young and old, up north, down south and everywhere between. Farouk Lawan still earns the huge salary of office despite being caught red-handed in wicked criminality. The whole world has seen the video of Farouk and Boniface collecting bribe. What is the reason for the delay? The offense of these government thieves is sheer wickedness; extorting and crippling the poor masses with fake subsidies to the tune of billions of dollars. 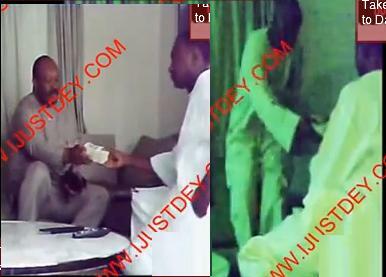 Farouk Lawan was caught taking bribe in violation of his pledge to Nigeria and duty to protect the people. Rather than serve the people, he was caught conniving to enshrine the robbery of the masses by these cabal who steal from both ends, resource and people’s earning. There is no reason for further delay. Farouk was caught red-handed since 2012. It is already two years later! We call on the people who can, to go to the Appeal court and protest for this case to be concluded immediately with no further delay. We call on the President of Nigeria to command the presiding judge not to dare abscond as he did last time and to conclude this clear case of robbery, pronto. Farouk is a thief. Petty thieves are swiftly locked in jails without trial for years sometimes. Do the cabal have two heads? Did God make them of platinum that they shall not suffer as we do? There is no reason why Farouk should still walk free and further still, even continue to rob us by being paid from the nation’s coffer. This is wickedness and insult of the highest order. We the people are not goats. We demand that justice is severed exigently. The whole world is laughing at us. We are carrying a curse this leadership bestows on us. The US in its largest forfeiture in history seized Abacha’s loot days after our leadership honored him simply to certify that we are an “abominable people, condemned.” We the people reject this. We the people have been waiting for this day and date with justice for a Nigerian ‘law-maker’ who has rewarded the people with wickedness and pain. Enough is enough. Seriously if you guys have decided to be proudly known as thieves and custodians of thieves, we the people have not. We rebuke this. $20 plus billion dollars stolen. A whole 20 billion dollars, our Minister of Economy admitted she does not know where the money is. And that was only for a select 16 months reviewed out of 60 months of this government. We rebuke your sustenance stealing from and cheating the millions of poor masses. We rebuke your love and protection of thieves. We strive to be decent and to start building a decent nation(s) where peace, progress, opportunity and prosperity can at last abound. Nigeria must be purged of its thieves, by incarceration or self-exile. The fuel subsidy fraud probe must be completed and the culprits must be punished. The fraudulent kerosene subsidy that robs our market women off of N100/liter, to the tune of $4.5 million daily, must be stopped immediately and all thieving culprits, Ministers, those involved at the NNPC and the executive government must be punished. Farouk Lawan must begin his jail sentence immediately. If there is no justice there will be no peace! Please people, head to the Court of Appeal Head quarters, Abuja. You can contact Ikechukwu on 08067677500 who is mobilizing peaceful protesters.